A dust storm engulfed the entire camp outside Fallujah during one of our aid distributions this week. The journalists who accompanied us into the camp struggled to find words to describe the scene that greeted them. In the midst of the greatest refugee crisis since World War II, the people of Fallujah are facing the worst of the worst. 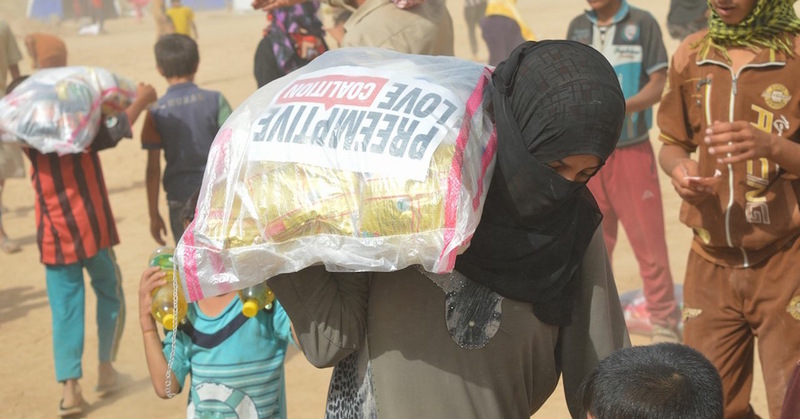 This week’s aid distribution was different, and not just because of the sandstorm. Conditions in this camp west of Fallujah are even worse than what we’ve encountered elsewhere. Instead of one family to a tent, several families have been forced to share a single tent—no space, no privacy, no room to breathe the stifling air. Many don’t even have a tent yet. “We don’t have anything,” one woman lamented. “I wish a mortar shell had landed on my house in Fallujah and killed me,” another said. The camps are overwhelmed. Yet you keep showing up. When families need something to eat, you show up with food. No one has given more food for the people of Fallujah than you have. When families have no place to cook their food, you show up with kerosene stoves. When they are threatened by disease and inadequate sanitation, you show up with hygiene kits. The need is overwhelming. Fallujah’s families need to you continue showing up, even—and especially—when no one else will. UPDATE: Join us for a special livestream with IF:Gathering to hear the latest from CEO Jeremy Courtney on the crisis in Fallujah—tomorrow, 12pm Central time.